Bohdan Lachert, a prominent Polish modernist architect, co-founder of the avant-garde art group Praesens and a member of CIAM (International Congresses of Modern Architects) had a vision of building a new housing estate on top of the ruins of the Warsaw Ghetto that would rise like phoenix from the flames, reminding the world of the tragedy that the Warsaw Jews had gone through. The unique commemorative project had both practical and metaphysical aspects. Unfortunately, historical impact and politics partly thwarted the architect’s original vision. The walk leads through South Muranów. 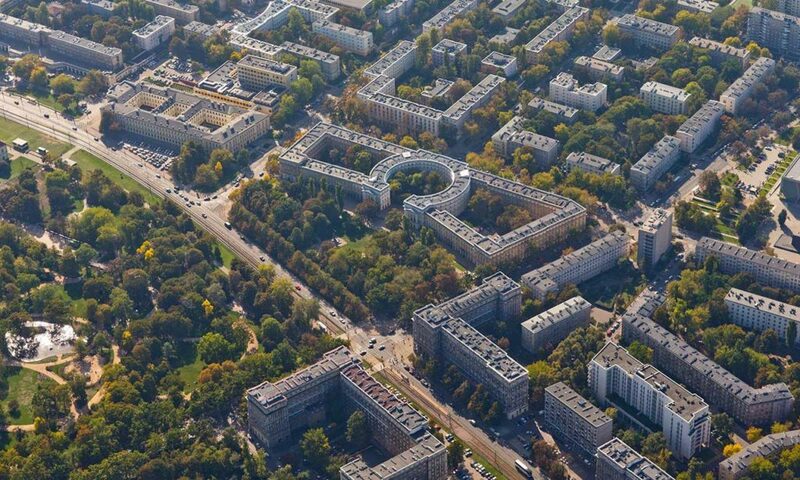 Its extended version includes the northern part of the district, created by a team of designers led by Stanisław Brukalski and Stanisław Szurmak. This tour will show you how the project was drafted, its later modifications, the fate of the designers involved in its creation, their work in relation to the rebuilding of Warsaw and other reconstructions of post-war Europe (Le Havre, Rotterdam, Berlin).